Hi friends! I stitched up this Rainbow Gallery pattern for the pedestal frame for next month. I am now stitching up a free pattern for the cubby shelf. 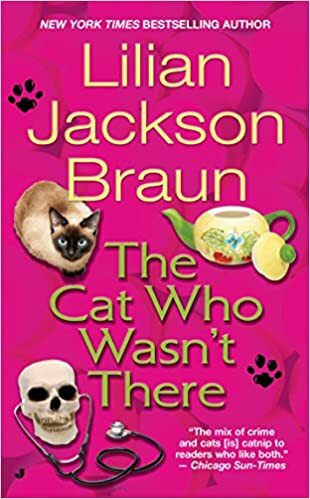 In this mystery in the bestselling Cat Who series, Jim Qwilleran takes a trip to Scotland and brings home a case that only his cats Koko and Yum Yum can solve... Qwill’s on his way to Scotland—and on his way to solving another purr-plexing mystery. But this time, Koko’s nowhere near the scene of the crime. He and Yum Yum are back in Pickax, being coddled by a catsitter...but Koko won’t sit still once Qwill’s traveling party returns—minus one member. He’s behaving oddly, and Qwill knows what that means: Koko may have been miles away from the murder scene—but he’s just a whisker away from cracking the case! The February cubby shelf display. Thank you for stopping by. Your comments always encourage me. Thank you. I am so blessed to call you friends.💗 I hope you have a wonderful, stitchtastic week! Your March pattern looks very much like spring, fresh grass and the first pink flowers. Very nice your February looks Cubby. Love your new stitch ,you are stitching some lovely designs . Keep warm ,and enjoy your week . Your February cubby shelf looks wonderful. I always love seeing your cubby shelf! It's wonderful! A great March finish too. Cute stitch! Nice color choices. Love that pink! I just love your cubby shelf and how it keeps growing!!! Stay warm! Hi Vickie.... Your March stitch is just adorable! Love your color choices! And you finished it in plenty of time for March! You know I have seen these books at my library for years. They have always caught my attention and yet I have never read one! I may have to try them. We are trying to stay warm here too believe it or not. We are definitely not as cold as you are but for California we are actually freezing at night and cold during the day. We have had more rain this year than we have had in awhile. I think it is Scott making sure his garden is being watered...lol! Have a happy Monday my dear friend! Sending hugs and love your way! A lovely March stitch. Have a good week. The March piece is so "spring-y", very pretty! Thanks for showing the cubby shelf - I always enjoy seeing it. Congrats on the cute finish Vickie. The cubby looks great. 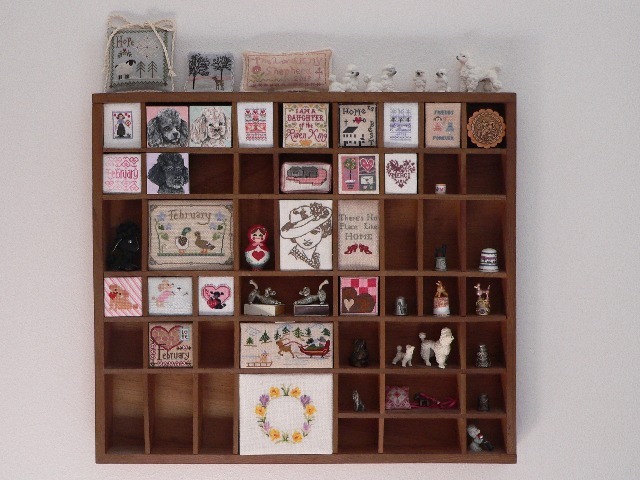 Hi Vickie: What a sweet new stitch for cubby shelf, it is lovely, I love working on lambswool, its so soft and pliable. I have read so many of Lillian's books, they grab you and will not let go each book is a page turner. We are having small little bursts snow today, Ick. Happy reading, my friend. 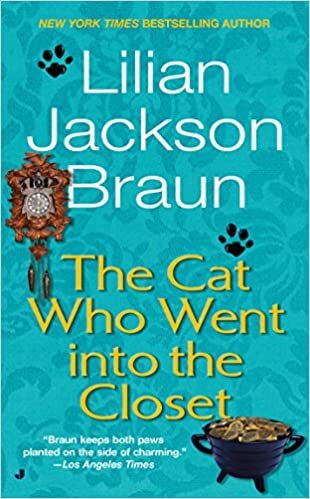 Have you read 'The traveling cat chronicles'? Also a good read. Your cubby is getting full and it is so cute! I like your March design with the cute little sheep!! Vickie, thanks for sharing a picture of the February cubby! It looks fabulous. Well done on your March finish! I love your March stitching! The colors are wonderful and what a beautiful addition to your cubby. I love the Cat Who books and you're making me want to re-read them again myself. 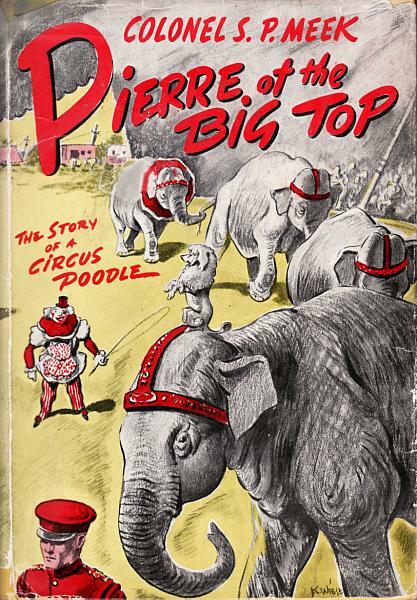 They are such fun books! 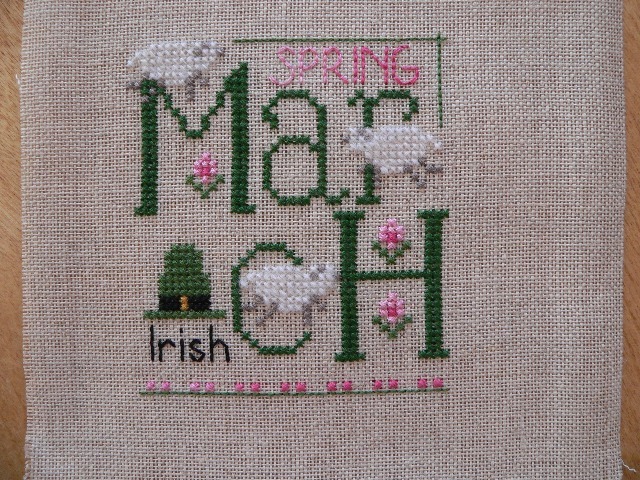 A lovely March stitch, the little sheep are cute. Your February cubby looks wonderful! The little March design will look great in the cubby next month! Ah, signs of spring! It's adorable and of course there should be pink in there. The February cubby display is gorgeous! 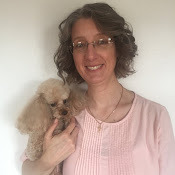 How adorable poodle miniatures that you have! I love this little March stitch! I think I would've changed the colors too; only to yellow so I could pretend the flowers were daffodils! Is Wisper floss hard to deal with? It's not one I've come across before. A great colour change Vickie! March looks very sweet! Thank you for the link ..... not sure if I will stitch but couldn’t resist saving! Tee Hee! Nice to see your cubby display too! I must add the Rainbw Gallery freebies to my rotation one year, they are all lovely. The cubby looks awesome! You are gradually filling up the holes each month.